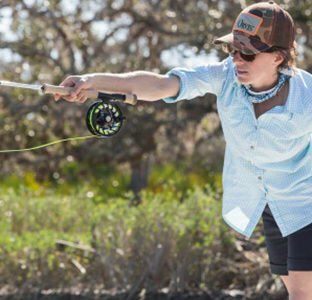 Editor-in-Chief at DUN Magazine; member of the board of American Fly Fishing Trade Association (AFFTA), and member of the board of Fly Fishers International (FFI); to say Jen Ripple is a leader in the industry short-changes her contribution to the growth in the sport. 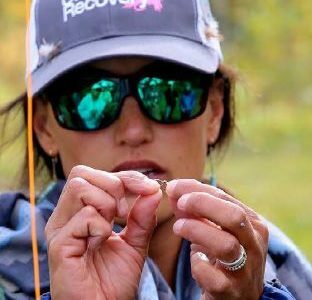 Since founding DUN magazine, she’s leading the charge in changing the face of fly fishing. ORVIS: What ignited the spark in you to start DUN Magazine? How did the idea for your business come about? JR: I was writing for a Midwestern fly fishing magazine, A Tight Loop, with 99.9% male authors, doing a women’s column. I wrote this great article, bigger than a column, and I wanted to put it in a women’s fly-fishing magazine but there wasn’t one. It made me think, if I was missing a women’s fly-fishing magazine, others out there were, too. That was June 2013. By September we had our first edition of DUN. JR: Women motivate me. I figured back in 2013; I couldn’t be the only woman on the water. I didn’t see them where I was fishing in Michigan but knew they were out there. It seemed like we didn’t have a history, that we were new to the sport and felt uncomfortable on the water. So, what motivated me the most was learning that history of women’s angling and being like, “No! Wait! We belong here.” From that point, my thinking changed—realizing that I belonged. I belonged on the river. I belonged in the fly shop and wasn’t going to take “no” for an answer. That was back then. Now, what motivates me the most is seeing that our DUN authors are mostly everyday women. At DUN we feel empowering an everyday woman’s story is important. I can have the big names in the industry write for us, but I don’t think that’s as inspiring as hearing from someone who picks up a fly rod for the first time and falls in love with it. So, I think it’s the everyday story that motivates me the most. JR: I think the biggest life lesson is, “There’s peace on the water for me.” To come from where I did to what I’m doing now was a reinvention of myself. I’ve re-invented myself through the water. You can start over at any time and do what you love. ORVIS: What is the harshest criticism that you’ve endured and conquered? JR: It’s been a positive ride so far, so this is hard for me. But, I’d have to say it’s the guides out there who say, “I don’t care if women fish, I just don’t want them on my water.” That said, I think that’s a really small, vocal minority. In regard to starting the magazine—there was a guy in the industry, and I was telling him that the first issue of DUN was about to drop. He said, “Oh that’s great. You’re going to have one magazine and it’s going to be fabulous, but you’ll never have another one because there aren’t enough women who fish.” I was taken aback for a split second and then thought, “He’s gotta be wrong.” So, I think that small percentage that gives you a bit of negativity is a constant you need to deal with. But honestly, the hardest thing to overcome was putting a mag together with no background in magazines or journalism. You just don’t know what you don’t know. But it’s a daily thing, and if you want to do something, you just go for it and figure out a way. ORVIS: What are some things that DUN Magazine currently is doing to help break through barriers? 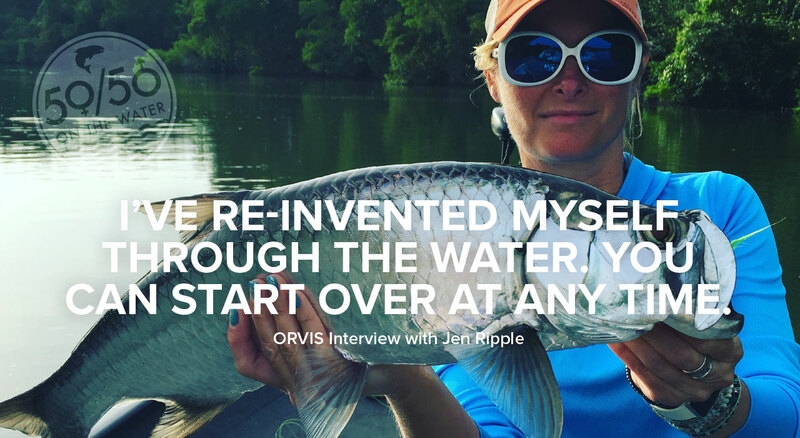 JR: I’m a big advocate of 50/50 because Orvis was the first company, in my opinion, to take what women anglers were saying and actually do something in response. The initiative means simply that we belong, we’re here to stay, and we’re dedicated to getting other women on the water. And ultimately, for me, it means exactly what our motto at DUN is: Empowering women, not ignoring men. We just want to know that there’s a place on the river for us. JR: Fly fishing is a great sport for women because they don’t have to be 20 and a rock star in the gym to enjoy it. You don’t have to be in a perfect state of health to go do it. I mean, I could never go running. But to fish, I don’t have to be in perfect physical condition, which is great because I’m 50 at this point. You don’t even have to be good at it to love it. You can pick up a fly rod for the first time and enjoy casting. Then once you take to the water, there’s just something about standing in the river and being near water that makes life better. We all have stressful lives, and as women we can get too caught up in what we’re doing for everybody else. In fishing you tend to slow down, take that moment, and be present. That’s what I think it’s all about. JR: Over the last 5 years it’s been fun to watch the changes that have happened in the industry. When I first went to trade shows, the attitude was, “Yeah, this is EPIC everything!” No gear for women. And if there was some, it was ill-fitting, not techy, almost novelty. Now the industry gets it. Women’s waders are made for them—techy and well thought out. And there’s a lot more women’s gear out there. So, it’s been really fun to watch the industry response grow and see that they’re finally getting it. ORVIS: Most memorable fly-fishing industry moment of 2017? ORVIS: What do you hope the future holds for you and what are you excited about in 2018? 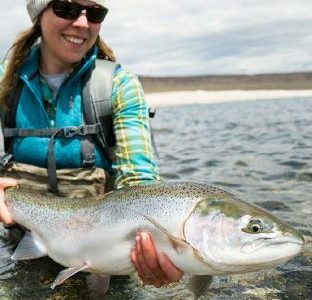 JR: We’ve had growth, and women have been the largest growing demographic in fly fishing in the last year or so, and it’s going to continue to grow. I know it will. As a magazine editor, I’m excited to tell their stories. There’s going to be new women, new girls, new people entering the sport and they’re going to know that they have a community out there. JR: Be like Nike, and JUST DO IT. For me, there’s no happier place than outside. Studies have shown when people are outside in the trees their mood improves. This is one thing you can do to make yourself happier that costs no money! How many pills do you have to buy in order to make yourself happy? Throw them away! Just go outside! The dishes can wait, and deadlines will always be there. Get up a few minutes early. Have your coffee outside. Smell the fresh air. Look at the beautiful sun that keeps rising every morning and inspire yourself. Your future self will thank you.